Paleostrat has changed its name to GeoStratSys. "The GeoStrat Digital Information System (GeoStratSys) provides a desktop working environment for stratigraphy-related geologic data. Providing a secure private working space, access to public data, imbedded GIS capabilities, and visualization and analytical tools, it may be used by individuals, collaborative projects, and organizations in support of research, publication, and public outreach. GeoStratSys is an evolutionary version of PaleoStrat that it replaces. It has been designed to move away from the classic web site that delivers static information to the next generation of web-accessible, digital information systems." They just started, so most services are not yet finished. However this really sounds exiting! I'm pretty curious how the final system will look like. Lutz, H., 1993. Eckfeldapis electrapoides nov.gen.n.sp., eine "Honigbiene" aus dem Mittel-Eozän des "Eckfelder-Maares" bei Manderscheid/Eifel, Deutschland (Hymenoptera: Apidae, Apinae). Mainzer Naturwissenschaftliches Archiv, 31, 177-199. Anyway, these 4 weeks in Eckfeld were great and exciting and this evening I discovered some old photos which brought even more nice memories.. 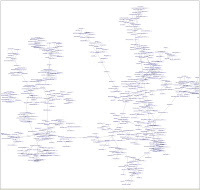 In his blog Taxonomy vs. Systematics Dave Hone suspected that at least some paleontologist are not aware that systematics and taxonomy are two different things. Even worse: As I wrote earlier both are completely ignored in a large number of paleontology related research articles! The authors of these articles do use species names but there is no 'systematics/taxonomy' section which explains the taxonomic concept of the author. Some may now argue that this is not a problem because many species used in these investigations are so common or simple that everybody knows what is meant by species XY. But this is not true. For example it has been shown by the 'ElKef blind test' (to clarify how aprupt the K/T extinction really was) that differing taxonomic concepts can drastically reduce the comparability of scientific results (Lipps, 1997, Keller, 1997). There are many reasons why this happens: Taxon names change, names are wrongly assigned or different reference specimen or images are used etc. The result is a big chaos of synonymies which is hard to unpuzzle. Therefore, scientists may use the same taxon name but mean totally different species. By carefully prepared synonymy lists taxonomists traditionally try to track such taxonomic changes. With our TaxonConcept tool we have stored thousands of synonymy lists and it is often surprising how complicated it can get when e.g. synonyms of taxon names get their own synonymy lists or taxon names have been wrongly assigned. As an example, the picture on the top of this page which shows a graph of the relations of the taxon 'Archaeoglobigerina cretacea' to other taxon names which includes hundreds of other taxon names. So, if you use taxon names in your studies try to provide some hints on what your taxonomic concept is. Otherwise you may leave future generations of with taxonomy puzzles like this. Keller, Gerta: Analysis of El Kef blind test I, Marine Micropaleontology, Volume 29, Issue 2, January 1997, Pages 89-93. Lipps, Jere H.: The cretaceous-tertiary boundary: The El Kef blind test, Marine Micropaleontology, Volume 29, Issue 2, January 1997, Pages 65-66. If you really want to scare away scientists from your project, say: "metadata". Most scientists develop a skin rash on having to deal with metadata, yet useful information systems depend on metadata of some form or other. Many metadata are straight forward and can be generated from context. The most difficult metadata elements seem to be keywords. Isn't there a way to generate metadata automatically? Well, there are methods proposed and there are some tools around for automatic metadata extraction. With less guesswork involved, the extraction process can be made more efficient. Therefore it is also useful to know which metadata can be embedded in which file formats. A report by Polfreman and Rajbhandari, published last week in the JISC information environment repository. The extensive report looks at methods and tools for automated metadata generation, mainly from the angle of generating Dublin Core metadata for institutional repositories. Robert has already looked at the tool offered by Yahoo! and considers it potentially useful for Stratigraphy.net. We'll keep you posted on any progress we make with automated metadata extraction.